Manualoha 609 is the perfect home for your whole ohana! Just 100 yards from one of Poipu's finest beaches, Brennecke's Beach, our home is also just steps from the Poipu Kai pool and tennis courts and the Manualoha ocean view pool. Surrounded by lush gardens and verdant walking paths, Manualoha is your home away from home. Pick up your free mid-size rental car at Lihue Airport and make the half-hour drive to our tropical oasis, where you can use our complimentary covered parking. 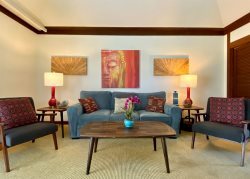 The condo's spacious living room has plenty of comfortable seating, a large flat-screen TV, and a private lanai with spectacular ocean views and dining space for 4. The living room opens into the chef's kitchen and dining area, which seats 6. For extra privacy, the master suite takes up the entire second floor, and consists of a bedroom with king bed and flat-screen TV; a spa-style bathroom with double sinks, large tub, and walk-in shower; and 2 lanais, each of which is an ideal spot for a nightcap with your sweetheart as you listen to the waves break on the shore. Downstairs, the guest bedroom has two twin beds that can be bridged into a king, and it shares the home's guest bathroom. In the living room, a queen-size sleeper sofa offers sleeping space for 2 additional guests. Tastefully decorated in gorgeous tropical designs, our home brings the breezy vibes of Poipu into every room. Wiki wiki (hurry) and book your stay today! Location, Location, Location: Right off the lush Poipu Kai Greenbelt, Manualoha 609 is within walking distance of several beaches, activities, and restaurants. And, the site itself has plenty of green space for kids to play a game of frisbee or adults to go for a run. Comfortable Accommodations: This recently renovated condo has tasteful decor and comfortable furniture. Best of all, the enormous master bedroom has 2 private lanais. Really clean and comfortable place to stay. Within walking minutes from the beach and restaurants by the ocean. Would definitely recommend this place! This was a wonderful trip. Kauai is our favorite Hawaiian island. The location of the condo in Manualoha was perfect, with a 3-minute walk to the pool and two beaches The pool was clean and quiet with a terrific view of the ocean from our poolside chairs. The grounds are beautiful and well-manicured. Our condo was just as described and was very clean, spacious, quiet and comfortable. We made frequent use of the lanai for coffee and cocktails. The kitchen was very well supplied with dishes, utensils, spices, and cooking condiments. We were pleasantly surprised by the array of beach items for our use, like chairs, umbrellas, mats and swim masks. The communications with our hosts were very clear and detailed. They responded quickly to our one question and provided timely updates as a tropical storm approached (and missed us!). The free rental car provided with our rental was terrific and we made great use of it. Covered parking spaces were a plus. We would definitely stay at Manualoha again on our next trip to Kauai. Most of the experience was by texting which I'm quite Ok with. It was easy and convenient. We really like the little extras such as having book selection to read, a bottle of wine to welcome us.,etc. I personally didn't mind it but my wife wishes there was air conditioning at the property to eliminate some humidity. I enjoyed the airflow in the evening. We have stayed on this lovely condo many times. It is updated, clean and in a perfect location. My only complaint this visit was that the palms in front of the lanai are blocking the ocean view. Beautiful condo with great amenities and fantastic location! We are a family of five with three boys ages 15, 13, and 10. We all fit just fine in the place and put my oldest boy on pull out sofa. At first I thought it might be a drag to have him in the main room, but we spent most of our time on the beautiful balconies. Everything was very clean and all amenities were perfect. The master is very nice (nicer than expected) and great views of the ocean from either balcony. The kitchen worked well and had most of what we needed and they even had beach stuff like chairs, snorkel stuff, and coolers. It didn't have central air but it cools down enough at night that it really is not an issue. The location is perfect and easy walk to Poi Pu beach. The boys used the pool a few times and they loved it. Overall, very happy with the rental. Friendly, accommodating, prompt, knowledgeable, responsive. Able to resolve TV remote problems very quickly and effectively. MANAGER RESPONSE: Mahalo for being wonderful guests;) We look forward to your return visit! Great stay. Beautiful condo, well equipped, well maintained. Pool location is incredible. Location is perfect. Only suggestion is to install a small safe in the closet. Oh, and one other thing. The ventilation in the downstairs bathroom is really marginal. Is there some way to get better air circulation? MANAGER RESPONSE: Mahalo for being wonderful guests;) We look forward to your return visit! We are going to order a safe and see if there is anything we can do with the downstairs bathroom ventilation. Had a great time staying in this condo. Lots of great details with a fully equipped kitchen. Beautiful ocean views and a short 5-10 min walk to a few different great beaches. 5-10 min walk to two great restaurants. We would definitely stay again. It was MAGNIFICENT! They were very quick to respond when we locked ourselves out and sent over someone to fix the beeping fire alarm asap. It was extremely close to Poipu beach and we could even see the whales from our upstairs balcony. I would note that there is no a/c but plenty of fans and with Hawaii's beautiful weather it is not really needed. The place was fully stocked with pots and pans and an entire beach set (board, snorkeling sets, sand castle items, beach chairs, etc). I would note that while the car is complimentary, if you are under the age of 25 you will be charged and it will not be reimbursed so remember that when renting the car (still worth it!). A "deep clean" (cleaning walls etc) is likely soon due as when we arrived there was food spatter on the upper walls of the kitchen, in the bedrooms etc. My family and I loves our stay at this unique rental. Carly was extremely accommodating, helpful, and easy to communicate with. This rental was just a few minutes in walking distance to a couple well renowned beaches. It was truly praises staying at this retreat. The balcony views were breath taking and the ocean breeze that came right up to the windows, porches and balcony were truly therapy. A free car rental was included in our stay. We felt at home and comfortable in this clean, luxurious, safe, perfectly located home. I highly recommend choosing this retreat. We will defiantly be back!! Thank you Carly for everything! You helped us create a dream vacation for our family! Great central location. Master bedroom suite is amazing. Nicely furnished. The lanai was awesome. Very prompt responses and detail instructions are much appreciated. Kitchen and bathroom supplies, as well as beach essentials, are well stocked. It is a beautiful and clean unit with quiet neighborhood. Our family from age 10 to the elderly enjoyed the cozy house tremendously. Thank you for your prompt and detail communications. This condo was awesome! We loved the split level floorplan, the master bedroom, and the 3 lanais! Super close to Poipu beach and access to two separate pools as well. Throw in a rental car included in The deal and you've got a great vacation! Excellent overall experience from booking to checkout. Thank you! Great communication prior to arrival; everything worked out well! The bed pillows in the master bedroom had an unpleasant odor from the accumulated head oils of prior guests. In the future, recommend buying new pillows/washing current pillows, and putting washable pillow protectors underneath the pillowcases, which will prevent the problem from happening for another guest. Thank you! MANAGER RESPONSE: Mahalo for letting us know about the pillows. We will replace them right away. Glad to hear that you loved your stay and look forward to hosting you again!